Since Johnnie’s severe injuries in July 2011 from an IED attack, we have posted a few updates of his progress. Over the past 2+ years, he’s continued to have multiple surgeries, endure grueling rehab, and recover at exceptional speed. He’s gotten physically strong again, gotten a new buddy–his dog Argos, participated in the Warrior Open, and most recently retired from the Air Force; just to name a few of his activities. There is a ton of information and stories about Johnnie available. We’ve included several here to try to capture his journey to the Air Force and overcoming adversity after his injury in Afghanistan. Here is a great, short video explaining his final jump. You can read more at AF Special Operations Command. And below is a picture of him falling from the C-130 over the Emerald Coast of Florida. As you can see, he got to spend a lot of time with one of our favorite people, Pres George W. Bush. Pictured below is Johnnie with his parents and sister at his retirement ceremony in October 2013. During his recovery these past 2+ years, he’s met many celebrities. What most people don’t realize is Johnnie, and the many other heroes like him, are the real celebrities. Their job is much more dangerous, difficult, and pays much less than today’s so-called celebrities. Now that he’s retired, maybe he’ll be able to spend more time on the book he’s writing, outlining his experiences from the injury–the pain, trials, stress on his entire family, his negative and positive attitude–the good and the bad that came with his situation. He’s also featured in Mark’s biography, along with a poem he wrote immediately after so casually finding out about Mark’s death from a teammate. 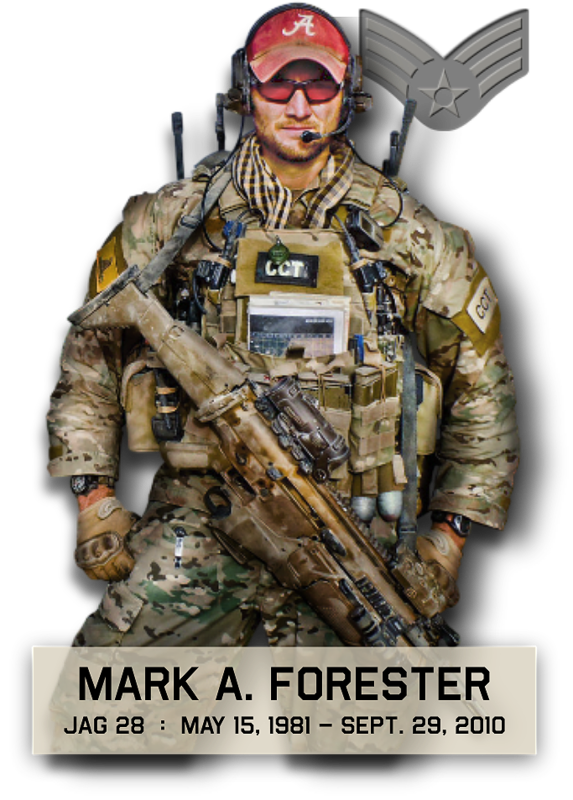 He was deployed to a different location than Mark, so he couldn’t attend any memorial services; he had to keep up the fight in his assigned area.